In 2017, NCT has partnered with design charity Shift to create a brand new digital service that will help even more parents to feel confident and capable in the first 1000 days of their child’s life. I was brought on to run the prototyping phase of the digital service. 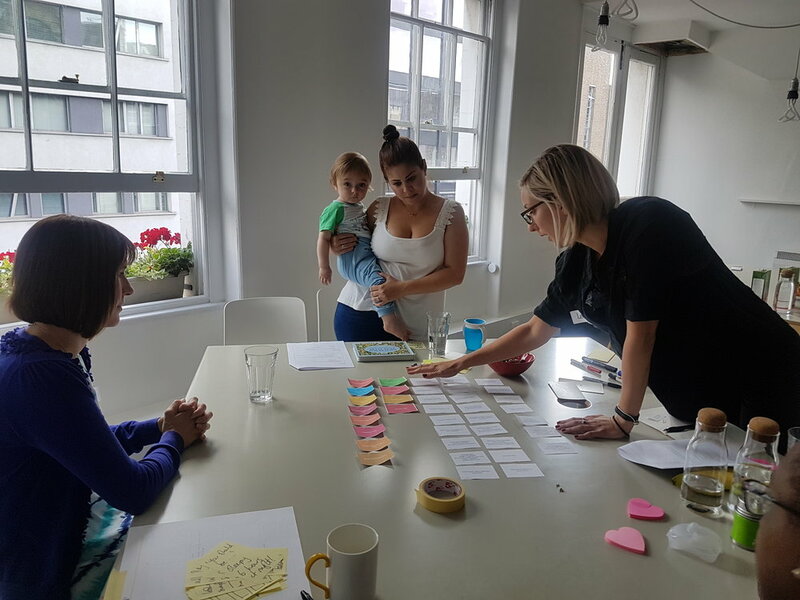 Throughout the project we have worked with parents, practitioners and volunteers to design a service that meets parents' day-to-day needs in the first 1000 days. We've had chats in coffee shops, interviews in homes, conversations in children's centres, been to play groups, held focus groups and sat in on NCT classes. Then in early May we held a workshop where we invited 30 parents, practitioners and NCT volunteers. During the fast-paced day, participants worked together using the insights we'd gathered through our chats and observations, to help define exactly what the service should be, what it might do and what it might look like. After that workshop, we shared some of the early ideas that we developed, and posted them on this website to get your views and decide which one we should focus on over the next few months. After in-depth interviews with mums and dads across the UK, NCT practitioners, volunteers, experts and over 300 votes, we decided on TIP. A simple, new way to share parenting info, strategies and ideas. Engaging multiple stakeholders to re-imagine new service experiences and value propositions which were communicated through journey maps, storyboards, blueprints and prototypes. In order to fully understand the end user, we conducted different methods ranging from card-sorting exercise, to understand what topics and categories these women were looking for, to building story boards together to get a better understanding of when they might use tip, as well as what would happen if a parent comes across a tip/strategy that is not NCT approved. It was important for us to understand the role of NCT practitioners, end users and how to design for the NCT brand as well. Things such as verification, personilisation and scientific research came up, that helped frame the needs of both stakeholders, and we had to design these insights into the final screens and service model. Through rapid paper prototyping, some wireframing and user testing, the preliminary UI design was conceived and constructed to be able to be tested. 3) Higher fidelity clickable prototype through atomic.io that lived on the NCT website as well as being presented at the Baby Show at Olympia in London in October. Sketch file of the GUI for the TIP app. After the analysis of these tests NCT and Shift continue the relationship to build an MVP in 2018.